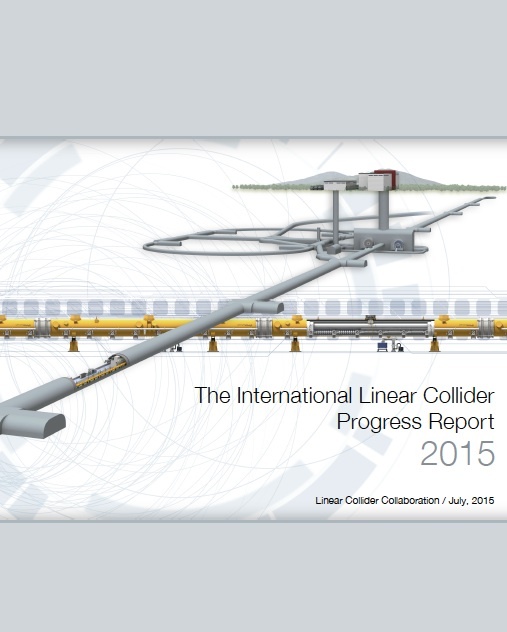 The Linear Collider Collaboration is pleased to announced the official release of the International Linear Collider Progress Report. The ILC Progress Report is a document outlining the technical progress after the publication of the Technical Design Report (TDR) in 2013. It contains the information regarding the progress in civil engineering studies, accelerator hardware design/development updates, accelerator system layout updates, integration/test facilities to be prepared for “hub-laboratory functioning, and updated project implementation plan, and further preparatory work. This progress underlines the technical feasibility of the ILC, and the capability of producing the spectacular collisions to create an array of new particles that will answer some of the most fundamental questions about the nature of the universe, such as the origin of mass, dark matter, dark energy, extra dimensions and beyond. “While we’re preparing the ground for political decisions to be made, we also continue to improve the technical design and organization of the project. This report is proof of that,” said Lyn Evans, LCC Director and one of the co-editor in chief of the repot. This report will provide useful information as a reference document for any survey and/or evaluation on the ILC activities. The challenge of colliding nano-sized beams at the interaction point involves three distinct issues: 1) creating small emittance beams, 2) preserving the emittance during acceleration and transport, and 3) focusing the beams to nanometer before colliding them. The ATF2, the Accelerator Test Facility II at KEK, Japan is a final focus beamline which addresses the beam size issue. The goal of ATF2 is to achieve 37-nanometre (nm) vertical beam size at the interaction point, which corresponds to the 6 nm at the energy of the ILC (250 GeV/beam). ATF2 has reached a beam size of 44 nanometre (nm) at the final focus, which corresponds to 7 nm at the ILC energy. For the ILC, 16000 superconducting RF cavities are required to be produced by vendors around the world. A global partnership between industry and laboratories is critical, and there has been a lot of progress. At the European XFEL accelerator hosted at DESY, Germany, which uses the same SRF technology as the ILC, more than 90% of 800 SRF cavities have been manufactured by two European companies and tested at DESY. Also, more than 60 out of 100 cryomodules have been assembled and tested. At the ASTA test facility at the U.S. laboratory Fermilab, a very important milestone was recently achieved. The full ILC type cryomodule was powered to the nominal gradient of 31.5 megavolt per meter, reaching the ILC specification. Another U.S laboratory, SLAC, started the Linear Coherent Light Source (LCLS) II project in consortium with the US SRF laboratories. In Japan, KEK has completed the installation of ILC type cryomodukes into the beamline, and preparation for the beam commissioning in progress. The Linear Collider Collaboration has been working on a post-TDR design update on the basis of assuming a model site. In this context, a vertical access shaft to the detector hall at the interaction point has been approved. An extension of the main linac tunnel has been approved for optimising electron and positron collision timing and for providing sufficient redundancy of main linac cavity gradient integration. LCC is continuing to seek for potential cost saving actors in balance to necessary increase. “We are continuing to improve the ILC accelerator design with seeking for the best cost effective solutions and with keeping our scientific goal as proposed in TDR. We also anticipate to provide timely responses to various advices given by MEXT ILC Advisory Panel in Japan. ” said Akira Yamamoto, another editor in chief of the report. “We will make our best effort for further optimization of the ILC design, such as the ILC main-linac cross section, positron source redundancy, cryogenics layout, and the accelerator design parameter finalization, and for possible immediate start of the project once when ‘Green Signal’ will be given”, he said. JINR began to work on the ILC Project in 2005 with the support of its Scientific Council and the JINR Plenipotentiary Committee. One of the many research activities in this area is the development, in association with Paton Institute of Electrowelding in Kiiv, Ukraine and INFN, Pisa, Italy, of techniques to simplify and make reliable and cheaper the construction of the cryomodules, that are core of the main linac. In the current ILC TDR design both the helium vessel surrounding the niobium RF cavities and the connected pipes which channel the exhaust helium gas are made of expensive titanium, one of the few metals that can be welded to niobium by the electron beam technique. We describe the construction and performance of transition elements, obtained by explosion welding, that can couple the niobium cavity with a stainless steel helium vessel, thus saving large amounts of titanium. Several designs for these transitions have been produced and studied during the last years showing varying levels of reliability. Based on this experience a new design, including a minimal titanium intermediate layer, has been built. Preliminary tests yield impressive results, indicating a very strong resistance of the bond to extreme temperature shocks from electron beam welding to exposure to cryogenic temperatures. The developed technology for a trimetallic billet for manufacturing an adapter to be made such that the niobium–titanium bond is free of intermetallic compounds and the effect of the difference in the linear expansion coefficients of the ensemble components is eliminated.